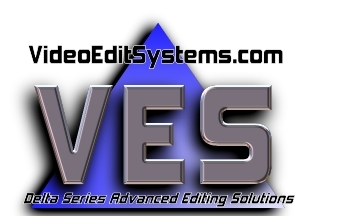 VideoEditSystems.com, with offices in Mission Hills CA (Los Angeles) and Burbank CA are proud to announce the availability of a fleet of VES/Delta 1000 editing systems for local rental (at your site). 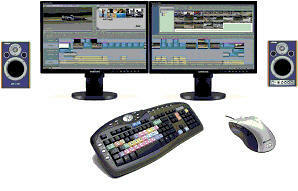 Software platforms include a choice of either Avid Liquid Pro or Avid Media Composer 3.0. Hardware includes a VES/Delta 1000 series 1 desktop system, including two Samsung 22-inch widescreen digital monitors, a pair of Edirol close field audio speakers, custom coded keyboard, and mouse. Each tower is populated with four SATA II hard drives: 250 GB, 250 GB, and two striped 500 GB drives for Media storage. In addition, each system comes equipped with an internal RAID-5 array providing an addiitonal 2 TB (1.5 TB usable) of protected storage. Connectivity includes GigE, Firewire 400, USB 2.0, and eSATA. Liquid Pro includes a Liquid analog breakout box. Avid MOJO is optional. Panasonic P2 card reader/browser is built into our systems! Software issues are not a problem with the VES/Delta series editing systems, since all of your system software can be quickly and painlessly restored by means of our renowned RED DISK kit. Rent for just one day; or as long as you need to. Our rates are very affordable; and, in some cases, we can even can apply a large portion of the rental towards purchase. Click here to read or download the complete brochure about these systems. If you would like us to contact you about editing system rentals, you can use this convenient reply form. This is just preliminary information gathering, and does not constitute a Rental Reservation nor Rental Agreement.